Congratulations to Neil for pumping, flapping, swaying and generally cheating his way to victory today, lapping the entire fleet in the process! 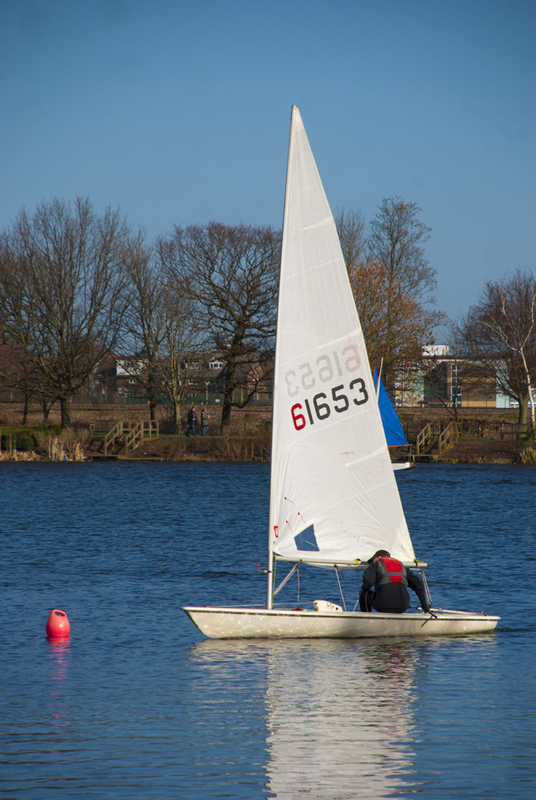 With glorious sunshine, but predicted winds of force 0 gusting to 1, DO Phill decided to liberate the fleet from rule 42 of the ISAF Racing Rules. You know, that pesky rule that says “a boat shall compete by using only the wind and water to increase, maintain or decrease her speed. Her crew may adjust the trim of sails and hull, and perform other acts of seamanship, but shall not otherwise move their bodies to propel the boat.” Although he maintained a ban on wiggling the rudder and lassoing, or otherwise tethering, dinghies to ducks and other wildlife. Rules relaxed, the fleet used a variety of ingenious boat rocking, flapping and swaying techniques to get things moving, with Robert and Derek looking like early contenders to swindle their way to a win. But it wasn’t to be, as Neil sneaked past and never looked back to take both first place on the water and victory in the race.